Today I am sharing a project that evolved from the fleece tie quilts that I made my grandsons last year. This is a very popular crafting project. 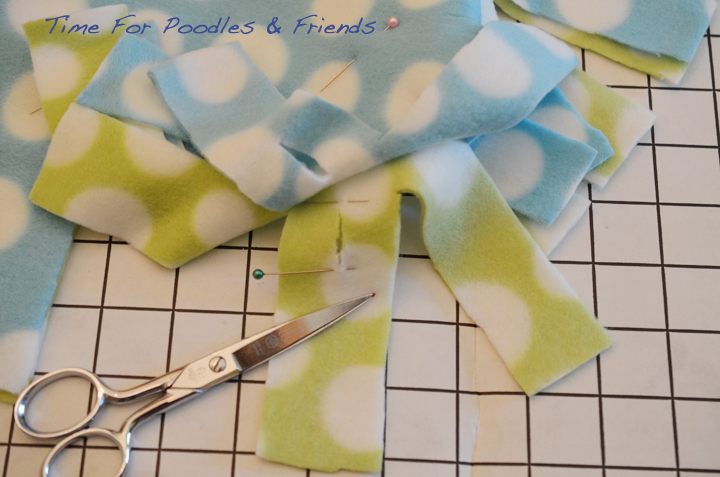 It is simply two pieces of polar fleece that are tied together using fringe. 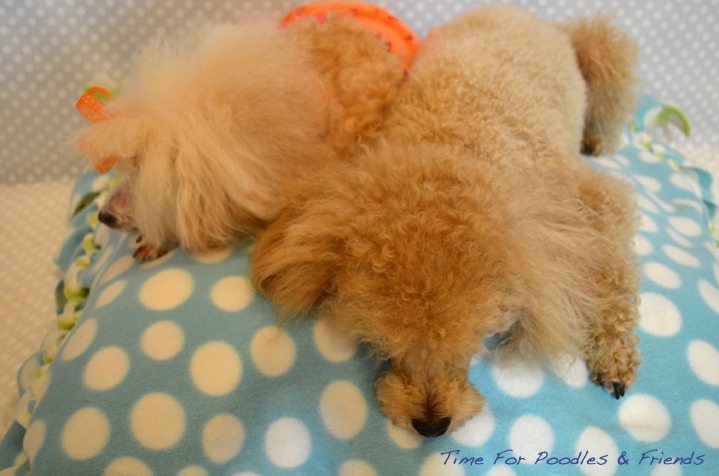 I wanted to to put an old pillow inside the blanket and make an always-needed pet bed. 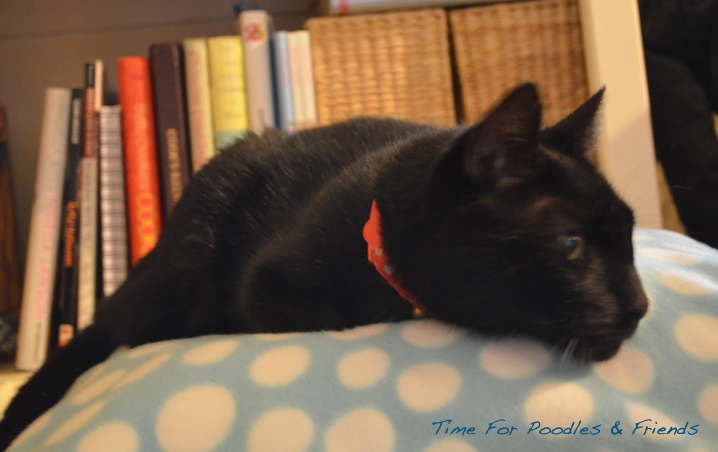 I guess you could call this project, "An Up-Cycled No Sew Pet Bed " Not only is this project fun but I think it would be a great project for upper elementary children. 1. A pillow in the size you want. Or another idea is to take an old pillowcase and stuff it with poly-fill. Or you could buy a pillow form. 5. 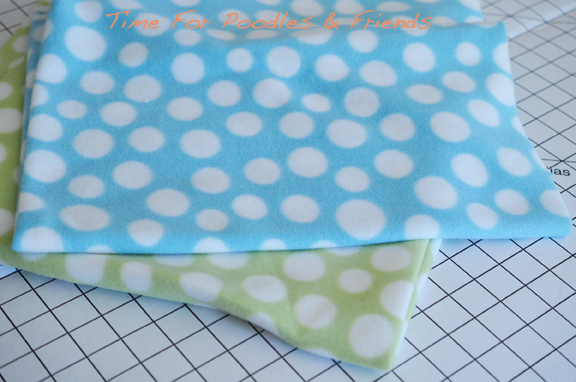 Two coordinating lengths of polar fleece that are in different patterns or colors Use a high quality fleece. I feel that cheaper ones pill more quickly. I will discuss how much fleece is needed in the next step. Make sure you do calculations before purchasing the fleece. You don't want to underestimate. Measure the pillow you want to use. I used a square pillow but a rectangle would work just fine. My pillow was 22 ½ inches. + 1" -This is for an ½"
selvage. Just cut on the dots. both fabrics the correct size. other with wrong sides together. Cut a 4"square out of each corner. 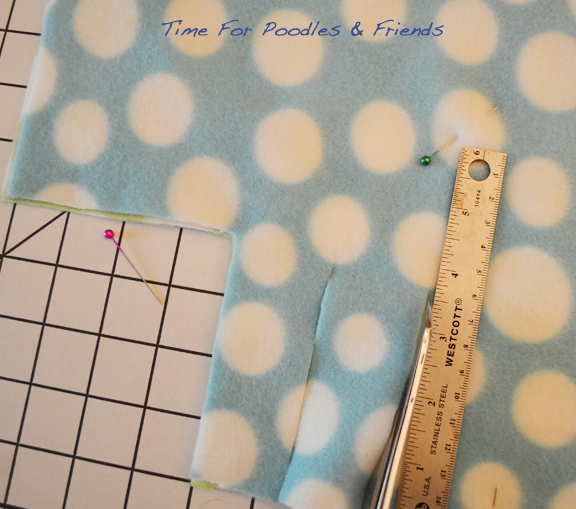 As you can see, I make a template and use it as a pattern for cutting out my corners. For this particular blanket, the fringe will be 1½" wide. I first measured my fringe width and the marked each width with a pin. 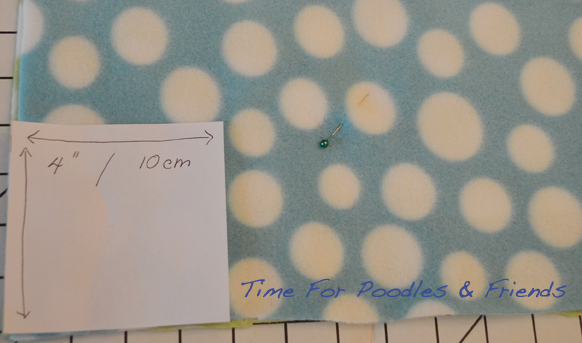 This way I can make adjustments if my fringe width does not divide evenly into my length of fabric. 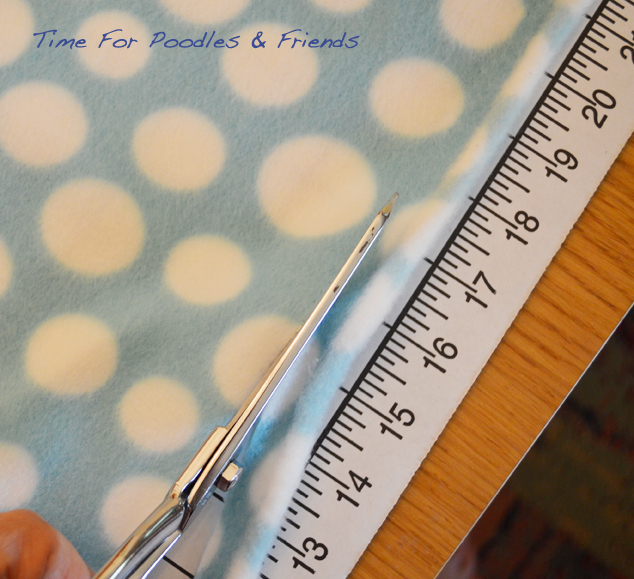 Then use a ruler for a 1½" template pattern to cut the fringe to 4". Step 1-Cut 1" slits in the top middle of each fringe. For this step, I have two versions. Neither of them is the knot tying generally used with a fleece blanket. For each version, I have made a small demo video. For this step, one video is worth tons of pictures. Pros: I personally can take these out in record speed to wash my bed cover. I don't think they take any longer to tie than Version 2. Cons: They don't look as nice as version 2, a bit fatter. Pros: These ties have a cleaner and neater look about them. For me, they take about the same amount of time to tie. Cons: They are very difficult to take out if you want to remove the pillow for a wash. Tie the ties and you are done. And we know who is going to hog this new bed in our house. And there are leftovers! Next week, I will show you what I have planned for these. Same technique for another useful item. We are so happy you dropped in-we loved your black and white picture yesterday! I am surprised by how easy this is. Such a simple and cute design. Very nice.